Singapore: Conergy, one of the region’s largest downstream solar companies, has designed and installed a 145 kWp solar power system for one of the most iconic landmarks in Singapore’s skyline, Marina Bay Sands, one of Asia’s leading destinations for business, leisure and entertainment. This marks the first commercial-scale rooftop installation for Conergy in Singapore and the highest location in the country that the company has fitted panels on thus far, at 200m above sea level. With solar panels lining the roofs of the iconic Sands SkyPark and covering an area of 880 sqm, Marina Bay Sands will be able to reduce carbon emissions by 70 tonnes every year. The 536 solar panels can generate 187 megawatt-hours of energy per year. 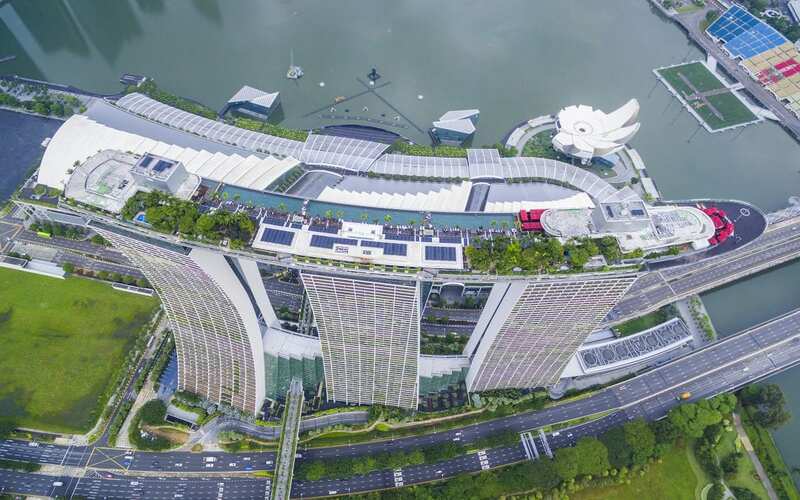 Key features of the Marina Bay Sands solar rooftop installation include Conergy PE 270 mono noir PV modules from JA Solar and roof-top racking solutions from Mounting Systems. Conergy collaborated with Asiatic Engineering for the local installation and construction of this rooftop system. The integrated resort’s environmental sustainability efforts include a $25 million Intelligent Building Management System that automates lighting, heating and water supplies, a water conservation program utilising rainwater harvesting and low-flow water taps, and the use of green materials during the property’s construction phase. Marina Bay Sands is also the first venue in Southeast Asia to attain the ISO 20121 Sustainable Events Management certification, and the first integrated resort globally to benchmark and certify its entire property through EarthCheck’s leading eco-benchmarking and certification programme.